A flat-top beam (or top-hat beam) is a light beam (often a transformed laser beam) having an intensity profile which is flat over most of the covered area. This is in contrast to Gaussian beams, for example, where the intensity smoothly decays from its maximum on the beam axis to zero. Such beam profiles are required for some laser applications. For example, one requires a constant intensity over some area in some techniques for the processing of semiconductor wafers and other materials. Also, nonlinear frequency conversion at very high power levels can be more efficient when performed with flat-top beams. 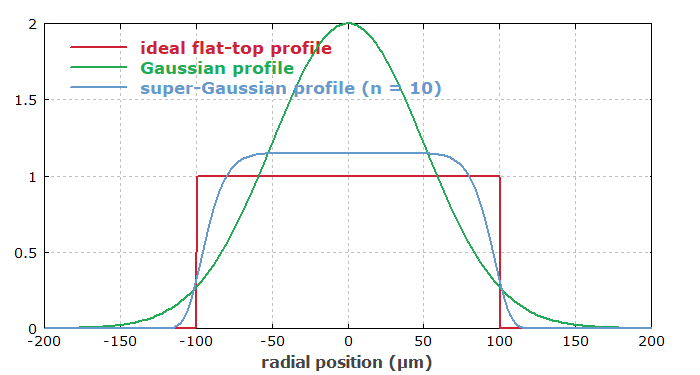 Figure 1: A flat-top beam profile (red) in comparison to a Gaussian (green) and super-Gaussian (blue) intensity profile. All three beams have the same optical power and the same effective mode area. The higher the order, the steeper are the edges of the profile. Flat-top beams can be coherent, having smooth phase profiles. However, flat-top beams made with certain beam homogenizers may be spatially incoherent, having rather complicated phase profiles. Note that in contrast to a Gaussian beam, a flat-top beam is not a free-space mode. This means that during propagation in free space, the shape of the intensity profile will change. The steeper the edges of the intensity profile are, the more rapidly will such changes occur. Figure 2 shows a simulated example for an initially supergaussian beam profile with flat wavefronts. Figure 2: Evolution of an initially supergaussian beam in free space. The beam profile first contracts and then expands again, now getting smooth edges. Note that the color scale of each profile is adjusted such that the same color saturation is achieved on the beam axis; in reality, the intensity decreases for the expanding beam. Of course, that change of beam profile may be negligible within the distance to the application. For beams with larger diameter and not too steep edges of the intensity profile, the beam size and shape may stay approximately constant. In many cases, a flat-top beam is obtained by first generating a Gaussian beam from a laser and then transforming its intensity profile with a suitable optical element. There are different kinds of beam homogenizers to do that transformation; some are based on diffractive optics.